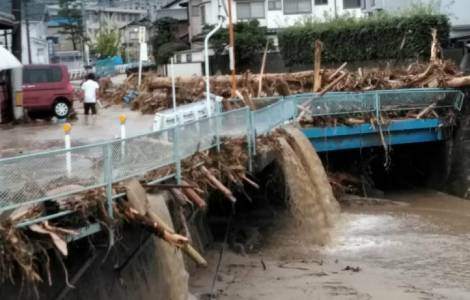 Tokyo (Agenzia Fides) - Caritas Japan, organ of the Catholic Bishops Conference of Japan, has launched an appeal to find volunteers who are willing to work for relief and rehabilitation programme in the aftermath of massive floods and heat wave scenario in Western Japan, the torrential downpour two weeks ago. The situation is exacerbated by the heat wave which has caused the temperatures to considerably rise abnormally. "The volunteer centers of Shakyo (social welfare council) have been opened in many municipalities. The affected dioceses of Hiroshima and Takamatsu are encouraging people to join the volunteer work. The volunteer work needed now is mainly mud and debris removal, which is quite hard for both rescue workers and the volunteers in this unusual temperature these days", Aine Ono, an official of Caritas Japan, told Agenzia Fides. Disaster-struck areas in west Japan are bracing for a prolonged heat wave just as survivors begin the painstaking task of cleaning up, after torrential rainfall triggered landslides and floods, killing 222 people since the beginning of July. Sweltering heat was the biggest challenge for rescue and recovery efforts: temperatures topped 39 degrees Celsius in landlocked areas. In the worst-flood hit districts of Okayama, Hiroshima, and Ehime Prefectures, the mercury clocked highs of 36 degrees C. Over 2,061 people were treated in hospitals for heat stroke and heat exhaustion. In the diocese of Hiroshima, information is being collected from each parish. The diocesan staff is joining coordination meetings with local leaders organized by the Okayama prefecture. The diocese has set up a volunteer base to receive volunteers to help clean up the houses. Caritas Japan will start fundraising in the country this week to support the activities led by the diocese, says Ono to Fides. In the Diocese of Hiroshima (Hiroshima and Okayama Prefectures), information on the most serious situations was taken into consideration and the work area was divided into three areas: Hiroshima/Kure, Onomichi/Fukuyama and Kayama/Kurashiki. The diocese of Takamatsu (Ehime Prefecture) is also encouraging young parishioners to join the volunteer work through Shakyo. "Basically, we support the activities of the affected dioceses and they are now in discussion and preparation on how to implement the support activities", explains Ono. The Ministry of Health estimates that 103,400 households in west Japan are without running water and are struggling to stay cool in dangerous weather conditions. Government agencies are urging affected residents with broken air conditioners to move to locations with air conditioning, even advising past evacuees to return to evacuation centers with cooling. According to the Fire and Disaster Management Agency, 4,500 people find themselves in evacuation centers, but access to water remains limited within those centers. Ongoing search and rescue operations are underway, with the help of 81 helicopters and 26,000 police, fire department, and Self-Defense Force crews on the ground. In Ehime and Okayama Prefectures alone, 3,600 volunteers worked on day one of a three day weekend to clear sand, mud, and debris in punishingly high temperatures.